Experience all the fun and excitement of our personal watercraft. 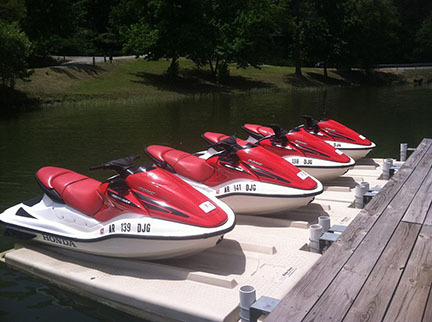 Jump on one of our 3 person Jet Ski and take a tour of Lake Greeson! Our Honda Aquatrax personal watercraft is built and designed for even the most inexperienced personal watercraft drivers to enjoy a day on the lake. Whether you have 1, 2, or 3 people you are for sure to have a day to remember. Take one out on the lake for some for some tight cornering and wet and wild fun or just a relaxing cruise around beautiful Lake Greeson. MUST be 18 or over to rent with valid credit card and drivers license. Must use valid credit card for rental. LATE CHARGES: assessed for any part of the hour for late returns at the original hourly rate of $80.00 per hour. There is a $9.00 nonrefundable processing fee on all cancellations. Cancellation notice of 24 hours is required to receive full refund. There is a $100.00 security deposit due at reservation, balance of rental will be paid in full at time of rental. Up to 3 life vests provided with rental - additional life vests available at $8.00 each for rental period. Must comply with all Arkansas State Laws regarding operation of PWCS. Flooded engines, lost key or safety lanyard, out of fuel, customer negligence, etc.